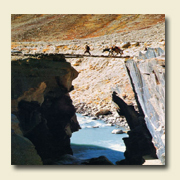 Royal Wheels India offering Zanskar Treks, Zanskar Valley Trekking in india. Zanskar is a veritable Shangrila. Surrounded by extremely high mountains on all sides, it could only be accessed through dangerous and high passes with an access window of a few months only, during summer. A thrilling yet enlightening experience for you. Day 01 : An Early morning flight from Delhi - Leh. An hour's spectacular flight over the Greater Himalayas, with views stretching as far as K2 in the west and the entire Zanskar range and views of Tibet beneath. On arrival at Leh, we drive 15 mins to our hotel, the Kanglhachhen, a traditional, and very comfortable and clean hotel in town. Rest and acclimatize. Overnight Leh. Day 02 : sightseeing for most of the day. 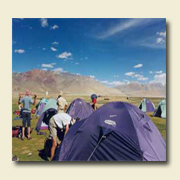 Light activity and short walks till Leh palace and the town's exciting market and outdoor restaurants. For the more energetic a visit to a few monasteries such as Spituk, Thikse and Hemis will be arranged. Overnight Leh. Day 03 : Drive Leh - Kargil (180kms). We drive from Leh to Mulbek / Kargil, through a spectacular moonscape. We drive over the Fotu La (14,000 ft), a high mountain pass, exiting the Indus valley and entering the Suru valley. Enroute, we visit the Lamayuru monastery, known to be one of the oldest monasteries amongst the 'Red Hat' sect. Overnight Kargil hotel. Day 04 : Drive Kargil - Rangdum (12,000ft). A spectacular drive past Panikar and Parkachik,with magnificent views of the Nun and Kun massifs (7000 metres),hanging glaciers and large meadows. We drive till Rangdum Gompa (12,000 ft).Camp overnight. Day 05 : Drive Rangdum - Remala (6 hrs). We drive to Remala which is the starting point for the rafting trip on the Doda river, a tributary of the Zanskar river. We drive over the Pensi La (14,500 ft), which enables grand views of the Zanskar peaks at the bottom of which is the Drung glacier that feeds the Zanskar river, 40 km below, into which we flow trip the next day. Overnight tented camp. Day 06 : Rafting expedition begins at Remala. Raft till Karsha Gompa, near Padum. We raft 30 km in 5 hrs which includes a break for lunch and hot beverages. We are surrounded by 6000 meters high peaks. River section today includes a Class II section, a good introduction for first timers as well as to the river in general. After settling into camp by afternoon, we take a hike to Karsha Gompa for the evening incantation. Day 07 : After a late morning start, we raft from Karsha up to Pidmu. This stretch is approximately 30 km with Class II and III rapids. After settling into the camp by mid afternoon, we visit the nearby villages of Pidmu and Hanomil. Day 08 : After packing camp, we raft 20 km to Nyerak, a Class III section. The gorge narrows in on the river - this indeed is a Grand Canyon in its own right. We stop for the day to pitch camp in a gorge below Nyerak village. Day 09 : Today's 35 km rafting section takes us from Nyerak to Lamaguru, through the core of the Zanskar A classic white water day with continuous Class III rapids, and a few Class IV rapid where the river squeezes between a gap of about 18ft. We stop for lunch near a huge waterfall at the confluence of Markha river with Zanskar. Rock formations, spires and an amazing palette of colours add to the trip today. Camp at Lamaguru. Day 10 : Day hike to Kaya and Skiu. Return to camp by late afternoon. (4-5hrs). Camp at Lamaguru. Day 11 : We raft 40 kms of Class III/IV white water from Lamaguru to Nimu today.We make camp short of Nimu,the confluence of the Zanskar with the Indus river. Day 12 : Raft approximately 25 km from Nimu to finish the trip at Alchi through Class III / IV rapids. After ending the trip at Alchi, we walk up to the centuries old monastery to view the beautiful frescoes and wood carvings. Drive back 60 km to Leh and check into hotel. Day 13 : Leh. Reserved day for shopping, sightseeing etc.